I’VE MOVED! OK, this is old news. I moved about a month ago, but it’s still surreal walking into my apartment every evening, seeing the space and realizing it’s just mine. I still expect Megan to walk through the door at any moment (let’s be honest, not to worry, she still does). 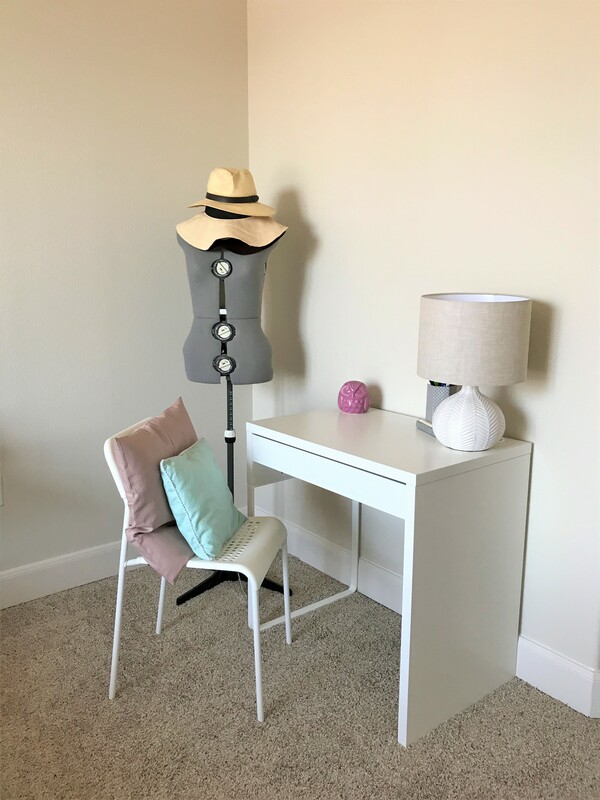 Even though my mom did a stellar job at forcing me to organize and decorate A.S.A.P.- literally within the first 48 hours of living there – there are still spaces I want to decorate and add to, but I figured I should show you before I start to introduce any new DIY’s! The space is pretty well put together, though I definitely have some artwork and decorative items in the works. I like to think that it’s my perfect little bachelorette pad. 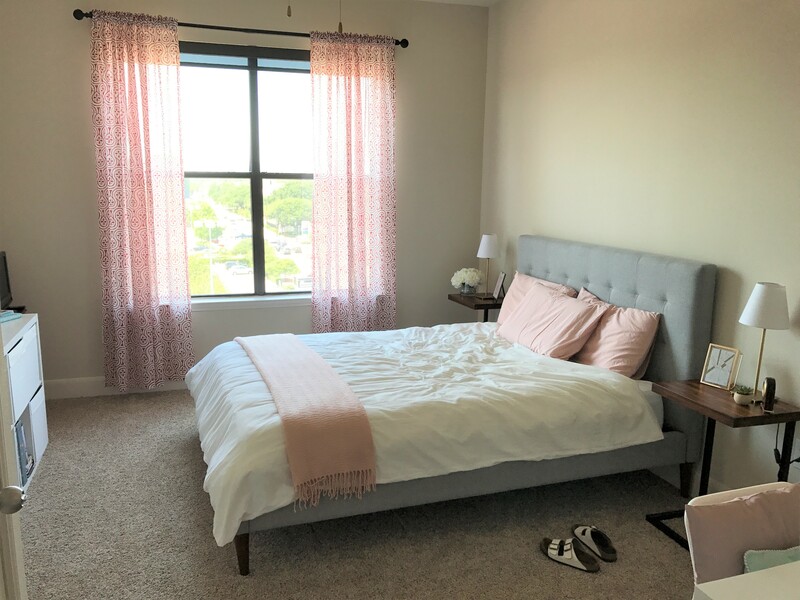 I kept to my modern and clean aesthetic, but made sure to add in plenty of pink and a few flowers! Take a look at what I have so far and what I plan to add in the future. This is the room that is probably the most finished. 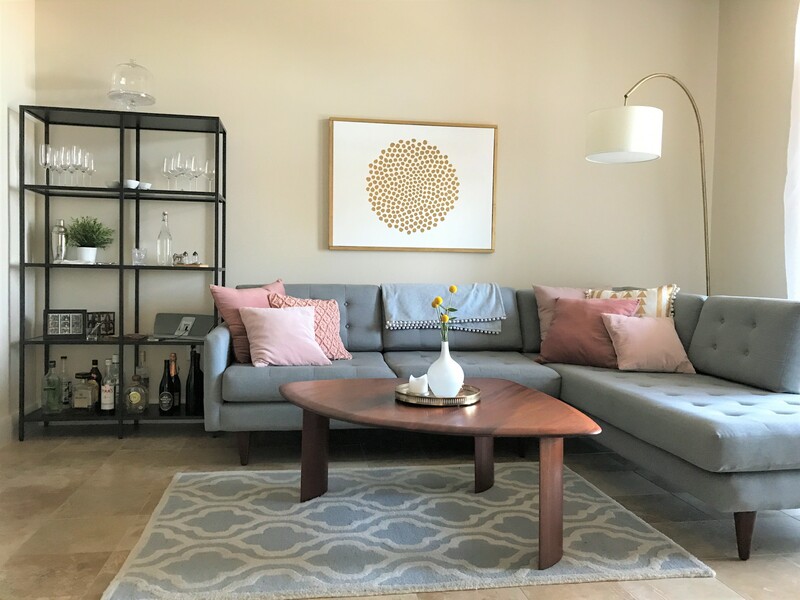 I owned the majority of the furniture before moving in and spent a lot of time planning this space as seen in this blog post. I am loving the blush pink pillows in all sorts of shades, textures, and sizes. I’ve become a self declared crazy pillow lady. The sofa also fits so much better in this space than it did in my last apartment. I love the open feel that it gives, and it has a better distance from the television. Recognize the painting? 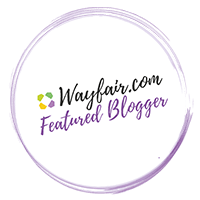 I made it in this blog post and reoriented it to be a landscape which works so much better in this space! 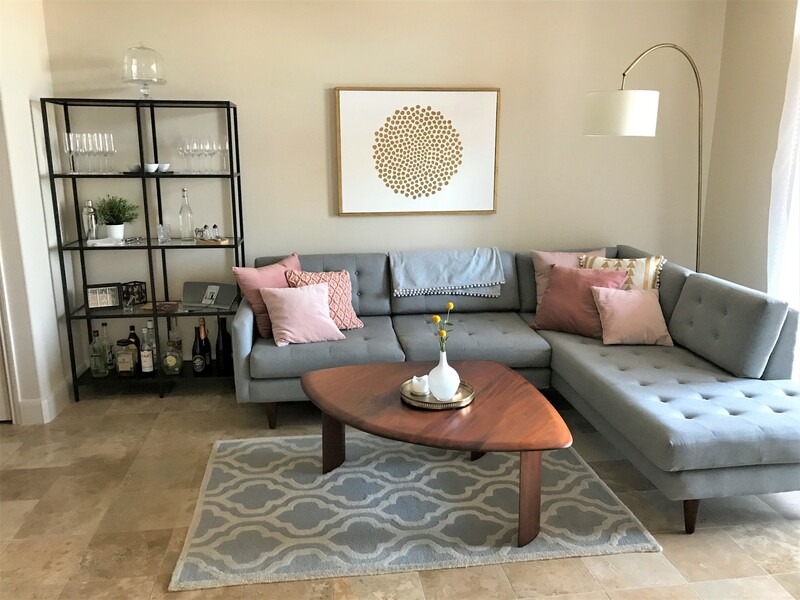 As for any changes, I had planned to get a new rug, but I am kind of enjoying the newness of the apartment giving new life to the old rug, so I think I will keep it for now. 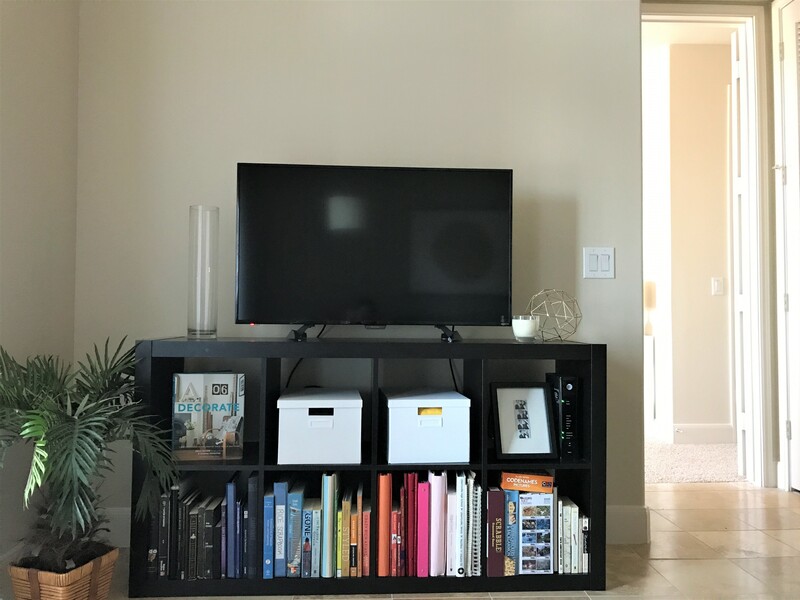 I restyled my IKEA shelf from a bar into a TV stand and have tons of books on it. The black isn’t my favorite, but the size is pretty perfect so for now it works really well. There exists an empty vase that I haven’t filled, and I think that TV wall needs some art too… will have to work on that. 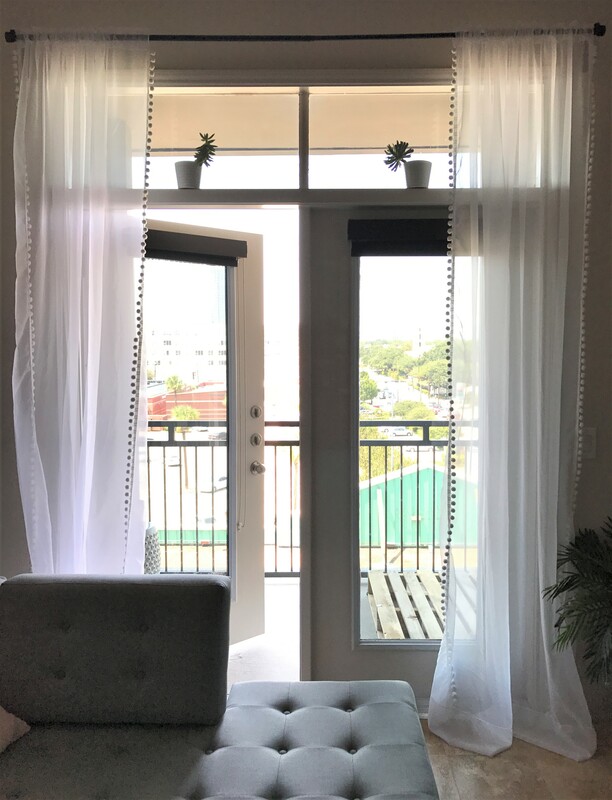 The curtains are a new addition that I made last month and featured in this DIY curtain blog post! So, the kitchen is a kitchen and there isn’t much to see other than the closed cabinets storing all of my junk, but I love the island layout. I hung up my herringbone art piece for a little while, but it was just altogether way too big for the space and doesn’t match my new color palette. I am thinking about hanging a ton of personal photos to make a little gallery wall, so make sure to look out for that! I also moved my old shoe/purse shelf into the kitchen for more storage where it now shows off my grandma’s tea set! I love having the items out so that I remember to use them more. Serving tea out of China is so much more fun than a mug. 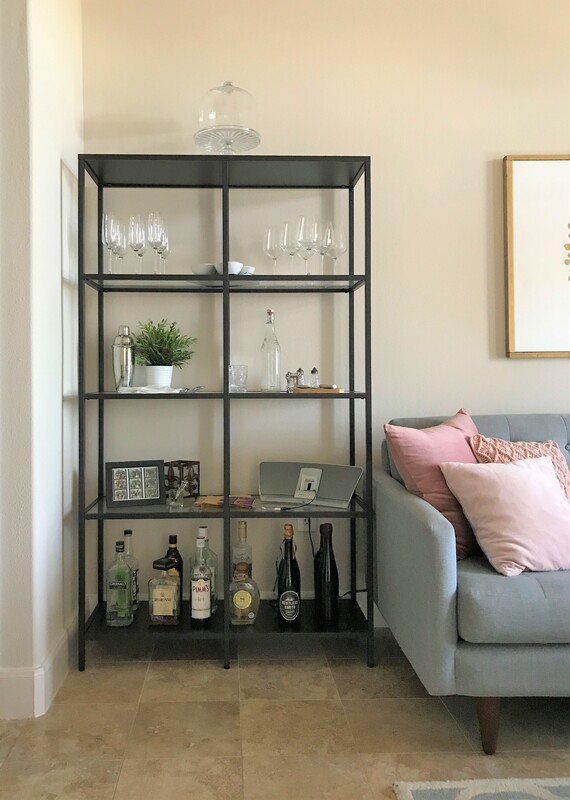 My mom had the great idea to style my glass bookshelf with bar items, and I plan to continue styling that and transforming it into a perfect serving station. 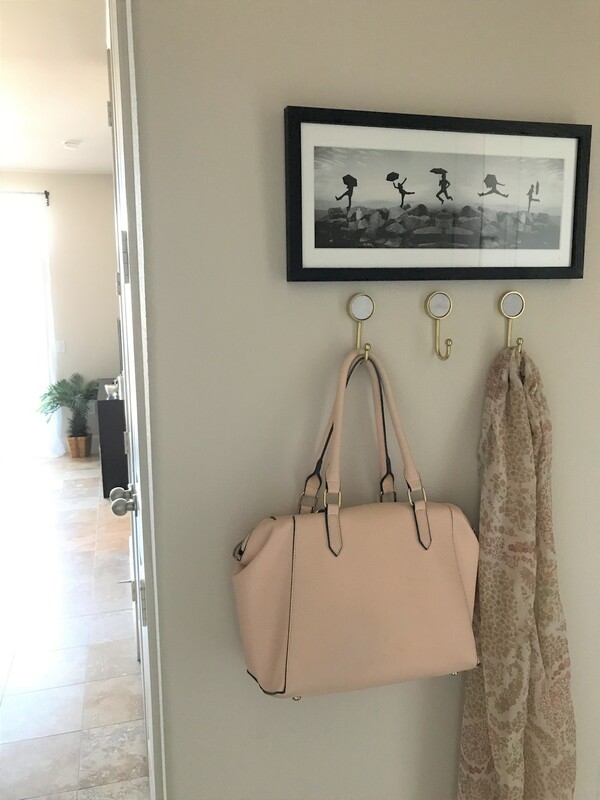 As a nice entryway organizer when I walk into my apartment, I hung up these cute gold and marble hooks from Target to hold my keys, purse, etc. So my bedroom remains the least changed of all of the rooms, mostly since my old room was so tiny that I couldn’t acquire that much furniture. I have kept the same organization where I use a bookshelf with baskets for storage, but I turned it on to it’s side to make it more of a workable surface. 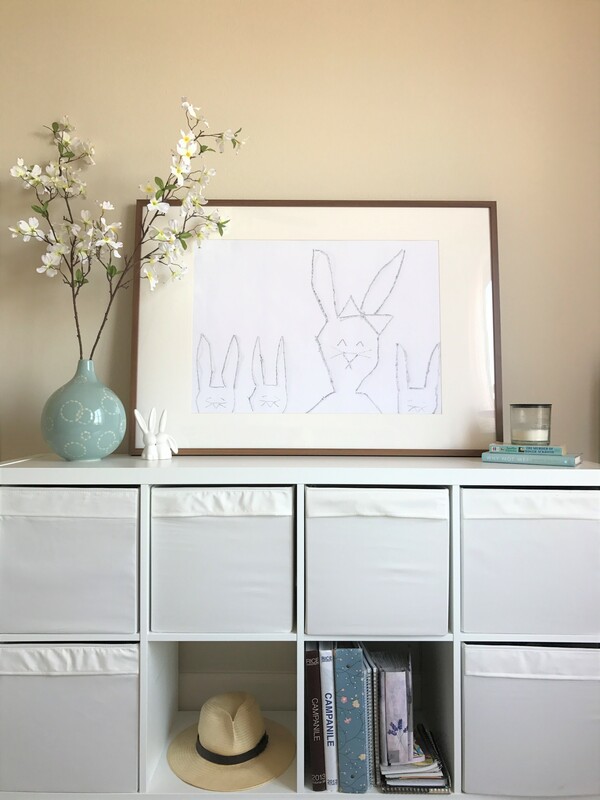 My mom placed the bunny artwork on top of it and I kind of love how it’s leaning… so maybe I won’t have to drill in to the walls after all! 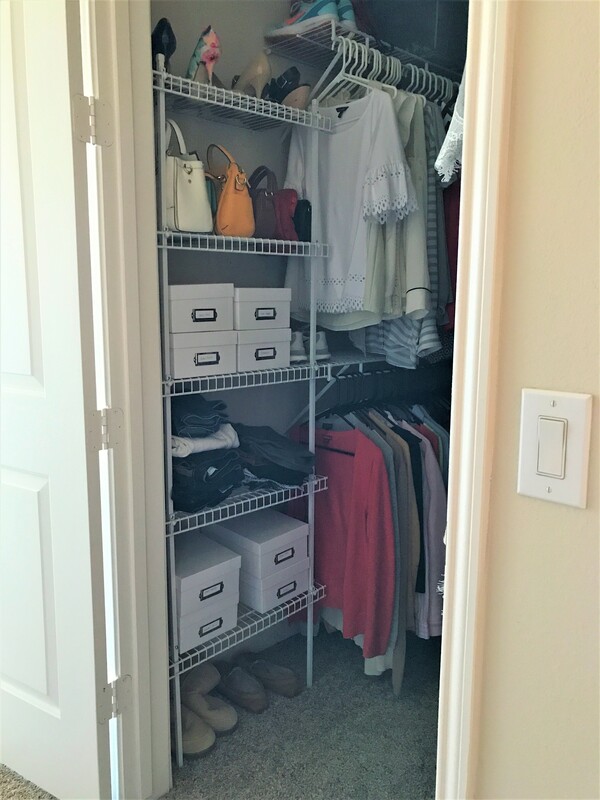 The one thing I took a lot of time doing was seriously organizing my closet using more photo boxes from Michael’s for my shoes, as well as hanging up clothing by type and color. 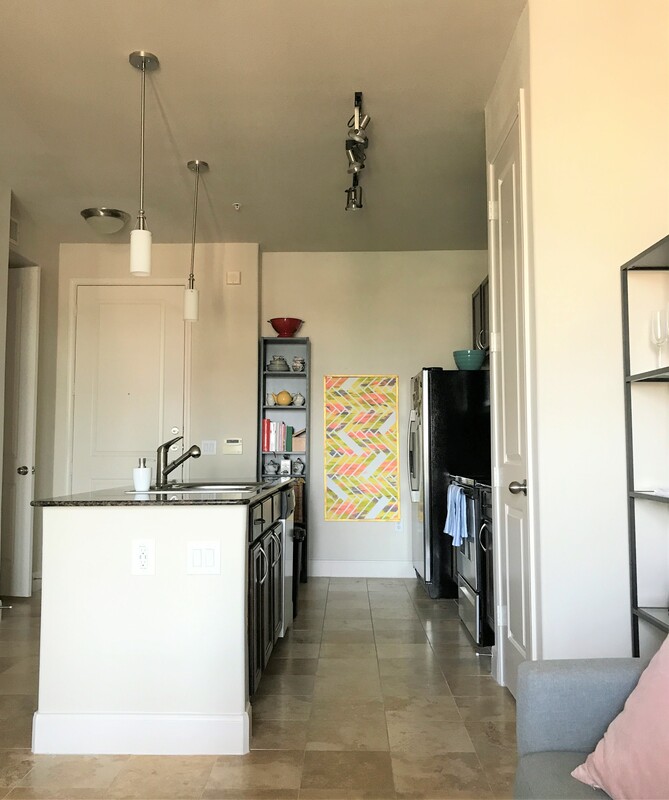 There is so much more space – I LOVE IT! I have a hallway that leads from the bedroom to the bathroom that I hung my scarves up in, and I like how it serves as a great little dressing room spot. Though it’s far too hot to spend a lot of time on my balcony right now, I’m excited to use it when it cools down! I have my same chairs and pillows, but I plan to get some plants and hang up some cute bistro lights. I would love to create a sort of plant wall to cover up the lower portion of my view since I look out on to some very lovely air conditioning units. Any ideas for west facing plants or thick shrubs would be appreciated! And there you have it! There are so many DIY projects floating around in my brain right now that it’s honestly overwhelming. I can’t wait to share more updates with you as time goes on! Your home is beautiful! Love your style. Oh my goodness… your place is unreal!!! Gorgeous! Thank you so much!! I’m so glad you like it! Haha thank you so much! Blush is my favorite right now. And I’m kind of an organizing fiend… it’s an addiction! Well done! I love your style. Thanks Aunt Marcia!! So glad you like it! I was lucky to have Mom to help me with so much of the grunt work, she had great ideas to use things in ways I never thought of! It looks amazing, Julia! Lots accomplished since I last saw it. Thanks mom! We really had so much accomplished in that first weekend that I’ve been able to just work on decorating ideas! Can’t wait to share more.